This has got to be one of the easiest smoothy recipes ever. Simply add whatever kefir you have left after a 24 hour kefir production period (making sure to strain out the kefir grain) to your blender. 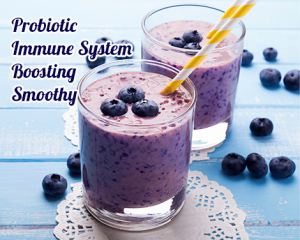 Kefir is an incredible source of good bacteria that has a host of other health benefits, which are covered in my article here. To learn how to produce your own kefir with very little effort, click here for my article. After that, add whatever frozen fruit you have on hand and blend until consistant. This will be one of the healthiest smoothies you’ll ever have – with all the cancer-fighting probiotics that kefir offers. For more on the health benefits of kefir, click here for my article. The nice thing about this is that with the fruit, you can hardly taste the kefir on its own. And if you can taste it you can add a little bit of honey to your liking to change the taste. I find that the frozen liquid in the smoothy is enough on its own to where I don’t need to add any additional liquid.